Sara Fitzgerald's daughter Kate us just two years old when she is diagnosed with a rare form of leukaemia. Reeling with the helpless shock of it, Sara knows she will do anything - whatever it takes - to save her child. Then the test results come back time and again to show that no one in their family is a match for Kate. If they are to find a match for the crucial bone marrow transplant she needs, there is only one option: creating another baby, specifically designed to save her sister. For Sara, it seems the ideal solution. Not only does Kate live, but she gets a beautiful new daughter, Anna, too. Until the moment Anna hands Sara the papers that will rock her whole world. Because, aged thirteen, Anna has decided that she doesn't want to help Kate live any more. She is suing her parents for her rights to her own body. "It is about Kate. Sort of." I press the newspaper clippings into my brother's hand; they'll do a better job explaining than I ever could. He scans them, then looks me right in the eye. His are the palest shade of silver, so surprising that sometimes when he stares at you, you can completely forget what you were planning to say. "Don't mess with the system, Anna," he says bitterly. "We've all got our scripts down pat. Kate plays the Martyr. I'm the Lost Cause. And you, you're the Peacekeeper." Ever felt goosebumps rise up your arms the moment you read the back cover of a book in a store? You realize it would mean you might end up not only reading the book but actually living every emotion, no matter how painful and yet you stride up to the payment section and buy the book. 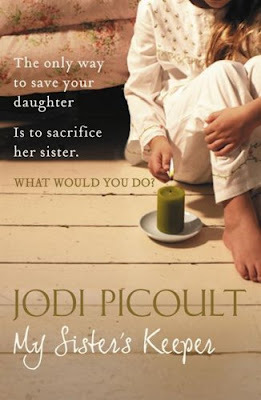 This is what happened with me and Jodi Picoult. I have always wanted to read Picoult but something always came in my way. And THIS IS NOT THE BOOK i wanted to romance Picoult with. But as fate would have it, I picked this one up. Thank you Polo aka @CreepyBangalan for recommending this one. Meet the Fitzgerald family. Sara and her husband Brian are doing everything to save their eldest daughter Kate. And in the family struggle are their two other children, Jesse and his sister Anna. Jesse and Anna have their own issues, but as usual they're swept aside for the greater problem, Kate. The Telegraph got it right when the praised Picoult. She doesn't just write a gut-wrenching novel, she writes humanity. Being a reader, you don't know whom to feel sorry for...the dying girl, the sister who's the keeper, the brother who couldn't save her life or her parents who think they are making the right choice. There are moments when you can just close your eyes and picture every scene so clearly....just like when Kate is in hospital and falls in love with another guy of her age who's in for treatment.....or the moment when Sara and Anna go bald so that Kate don't feel awkward while going out shopping. Watch out for Jesse though....He's a huge huge surprise in the book and its easy to think he's in the background when the book is practically about Kate vs Anna vs Sara. I thought I figured it out...until that moment. And then I close my eyes and think ahead of the ramifications from this unexpected twist...and as I finally make a conclusion, I read again. The next shock blew me away. There are times when you simply cannot stop reading even though tears are rolling down your cheeks. Being a guy, I'm attuned to physical pain...its the emotional ones that betray me...and Jodi Picoult just turned up the magnitude. I want to read all her books but I fear what I would turn into when I'm done with them. Jodi Picoult is a frigging genius. Her writing is a beauty in itself and forgive me, but she's absolutely heartless the way she squirms your heart out. One of the most touching reviews I've read in a while. Touched my heart. when I was in school , i read the real tale of a family who gave birth to another kid to save the oldest one. It was in Reader's digest and a really long article and most heart touching one. I some how feel this is based on that. Also , I have seen this movie and i did shed a few tears ..
"She doesn't just write a gut-wrenching novel, she writes humanity." That is absolutely what Picoult is. The book is based on the true life story of the Ayala sisters as Nimue has mentioned. I had also read the same article in reader's digest and later I had come to know of this book when I searched more on the internet about the sisters. I have read the book and seen the movie. Despite the very sketchy portrayal of Jesse in the movie, I really loved the alternate ending they have in the film. A soul wrenching tale told in the most poignant manner. Every line is the book is so painfully real and at times it gets so overwhelming that you just can't continue reading it. This book is a must read. And I cannot agree more with Arpita and MSM, this is THE best review I've ever read. Oh Oh .. book has a different ending . Now i sure have to read this.